I didn’t watch last night’s Democratic debate. I have to admit that I’m ready for the primary season to be over and to get on with the election. My friend James called after the debate and asked if I had seen Hillary’s final statement, which he liked very much. Since I hadn’t, I looked for it online this morning. Even the liberal blogs that I read are abuzz about it. In many ways I think this speech demonstrates how Senator Clinton should have run her campaign all along. From day one, the campaign should have been about the American people and nothing else. While I still intend to cast my vote for Hillary in the March 4th primary, I think Senator Obama will likely win enough support in Texas and Ohio to end Hillary’s campaign and to win the nomination, politically if not numerically. I’ll admit that I’ve been wavering a bit in my Clinton support lately. I haven’t liked some aspects of her campaign and I had hoped she would make a better case for herself. So, why am I voting for her? Two reasons immediately come to mind. First, when else am I going to have the opportunity to vote for a woman for president? A lot of Democrats talk about wanting to vote for a woman but say that Hillary just isn’t the right woman at the right time. The history of civil rights struggles suggests that new kinds of candidates rarely win the first time they run. It often takes the second or third or fourth member of whatever minority group to run and win. Personally, I just hope the first woman president is not a Republican. Our party should be ashamed if that happens. I sincerely hope that Barack Obama chooses a woman for his running mate. That would be an exciting ticket. Of course, Senator Clinton is not the first woman to run for president. Margaret Chase Smith ran for the Republican nomination in 1964. (She was a senator from Maine — I didn’t know that Maine had such a history of female, Republican senators.) 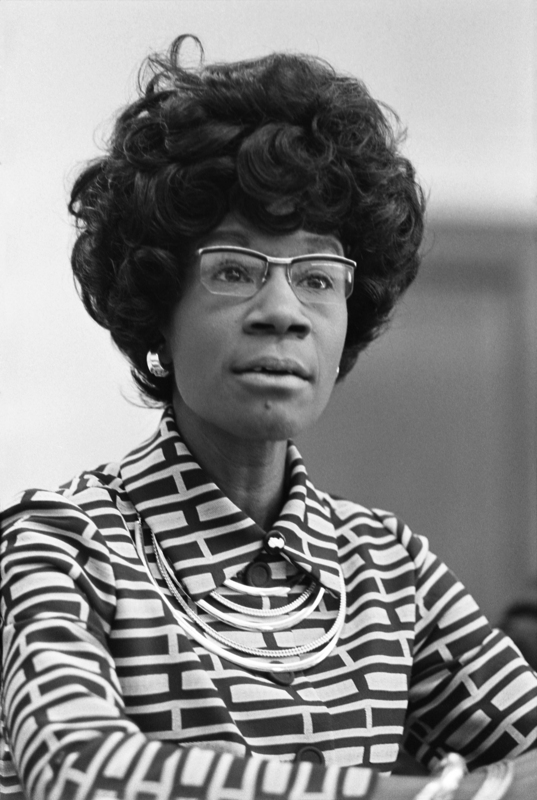 Shirley Chisholm, pictured here, ran for the Democratic nomination in 1972. Representative Pat Schroeder ran in 1988, but didn’t get very far. More recently, the most famous women candidates were Carol Moseley Braun and Elizabeth Dole. I really liked Carol Moseley Braun in 2004. I thought she was great in the debates, and her positions (rather than John Kerry’s or John Edwards’) were often closest to my own. I know a lot of people thought she was crazy, but I really liked her. Maybe I’m crazy too! I think Dole was screwed over by George H. W. Bush when he chose Dan Quayle as his running mate instead of her. If Bush had selected Dole instead, we might have already had a female president rather than 8 years of Shrub. As more women — Democrats and Republicans — become governors and senators, perhaps more women will run for president. If Obama chooses a female running mate, maybe we’ll have a woman president in just eight years. Regardless of what he does, I really hope that our next nominee is a woman. But I also have a second reason for supporting Hillary Clinton in the primary. It struck me this morning that I am Hillary! What I mean is that I feel very much like her when it comes to her strengths. She’s often praised (and criticized) for being more of a policy wonk than a personable politician. She can come across as rigid and “pushy.” And finally, she’s better at working hard than at inspiring. I think I share a lot of these characteristics. I work hard and am a good manager of whatever tasks I need to fulfill in my departmental and university service, but I don’t tend toward the grand vision of mapping out a direction for the future. If I were to become department chair or some other administrator someday, I think my strengths would be more administrative (i.e., managing the status quo) rather than in coming up with new and innovative ideas. My quietness tends to come across as being less personable and potentially more rigid and cold. And I can definitely be pushy when I think something in particular needs to be done about X, Y or Z. So, the idea that these qualities have hurt Senator Clinton’s presidential prospects bothers me. If I’m like her in many ways, does this mean that I too am never going to advance into departmental administration? Are my ambitions — which like Hillary are rooted in doing what I think is best for my department rather than in just personal ambition — going to be curtailed by an up-and-comer who suddenly inspires people but doesn’t have as much experience? So, I’ll cast my vote for Hillary on March 4th and will then wait to see who Obama chooses as a running mate. I’ll vote for him regardless, but I’ll get really excited if her goes beyond the same old choices and picks a woman to help him lead our country over the next several years. I pretty much agree with most of what you said. I have a problem with your assertion that Hillary should have been running her campaign the way she closed the debate. Since she was reciting John Edwards’ words, and he’s out of the race, I have to disagree with you on that point. In searching for posts using the meme “I am Hillary Clinton” I came across your post. Interesting, to say the least. Have you heard about the “I am Hillary Clinton” posts that are starting to go up? It started here.